On the corner of 14th Street and Chapin between U St. and Columbia Heights, sits the new Rooster & Owl. 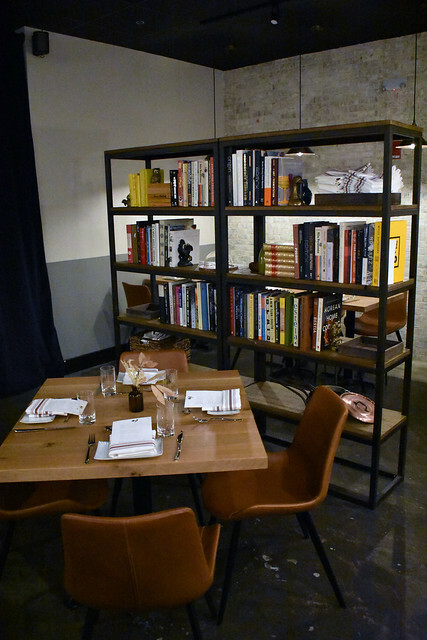 This stylish restaurant welcomes diners with its white-washed brick walls and homey touches like wooden bookcases full of cookbooks. 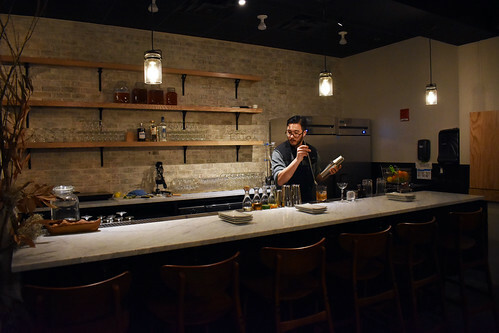 Rooster & Owl is the newest venture from husband-and-wife team Yuan and Carey Tang. The name is a nod to their opposite schedules of morning and evening. Executive Chef Yuan offers a frequently-changing prix fixe menu, four-courses, reasonably priced at $65. Wine pairings are not included, but we’d recommend them, as they were thoughtfully chosen by the bar team. 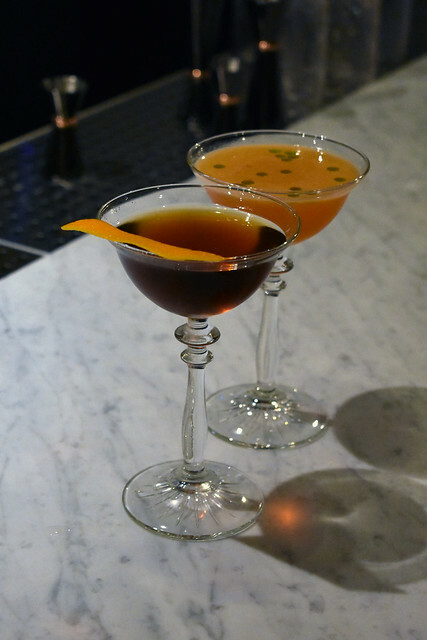 Diners can also opt for a la carte cocktails for $13. Cocktail director Jason Swaringen dreamed up our favorite, the “Eye Candy.” Made with Denizan Aged White Rum, carrots, turmeric, sultana, lemon, this is a cocktail that tastes healthy and won’t leave you full. We also enjoyed the “Fashioned for my Bay,” a take on the classic Old Fashioned, but with Wild Turkey 101 Rye, bay leaf, peppercorn, baking spices, and bitter orange. While it doesn’t open to the public until Feb. 7, we got a sneak preview of the set menu as the kitchen tests out the flavors of the season. Each table starts with a homemade “pineapple” bread to get the mood for the meal: Delicious. With a milk bread bottom and glazed top, we could have eaten a whole loaf. 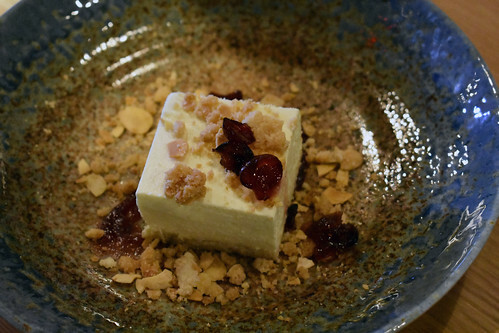 Rooster & Owl offers four options for each of the four courses, so we highly recommend taking a date or a couple of friends to share the wealth. For the first course, three of the four options really stood out. The endive salad, with romesco (a popular sauce across D.C. restaurants this season), ricotta, and garlic bread crumb, is a fun take on chips and dip. The crunch from the endive is super satisfying. We’d also raved about the kanpachi. 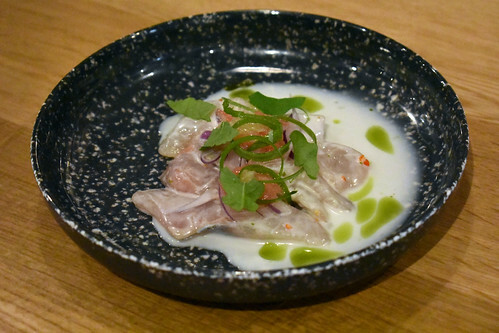 This crudo mixed flavors of coconut, kaffir lime, grapefruit. On top was a wasabi arugula that blew my mind — the heat from the wasabi was nicely tempered by the tropical fruits and cold fish. My hands down favorite dish of the meal was the carrots. (My mother would be so proud.) 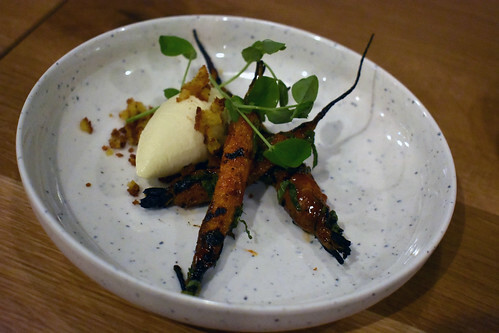 These carrots are overcooked in Carolina-style BBQ, and accompanied by a delightful cornbread ice cream. Honestly this was one of my favorite dishes I’ve eaten in D.C. in a long time. The ice cream would be great as a dessert (like with a blueberry compote in the summer) but pairs well with the acidity of the BBQ carrots. Not a bite was left on the plate. For your second course, we’d recommend you skip over the forgettable Napa cabbage and so straight for the meats. The octopus was well cooked and accompanied by gochujang-capers, sweet potato, and fennel. We also adored the “pot roast.” It was reminiscent of a mother’s pot roast, but elevated with pomme puree, oxtail, and rutabaga. Plus, we can appreciate the emphasis on the potatoes. For your convenience, we tried every option for the third course. We were enamored with the butternut squash ravioli. It was light, delicate, and tens times better than the stuff I’ve been buying at Trader Joe’s, let me tell you. Similarly, the Etoufee was a great blend of flavor as it mixed lobster, jasmine rice, and herb salad. The chicken was totally deconstructed and made into a roulade-like sausage with parsnip and wild mushroom. There was great in the mixed meats, but I couldn’t quite understand why one would want to make a sausage out of a perfectly good whole chicken. 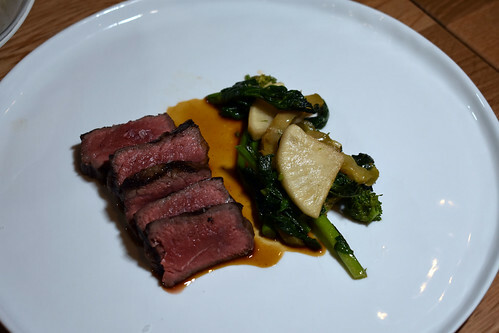 We preferred the dry-aged NY strip which, with braised daikon and broccoli rabe, was a fun take on beef and broccoli. All we wanted more au jus. To finish, you can’t go wrong with anything from pastry chef Olivia Green. But we’d highlight the marshmallows on the hazelnut dessert, and the tiramisu-like coffee one. One of our favorites was the winter citrus, which was utterly refreshing with lemon posset, blood orange, and pomegranate. The other star is the super fluffy goat cheese bavarois with honey and cranberry. Keep a close eye on Rooster & Owl. 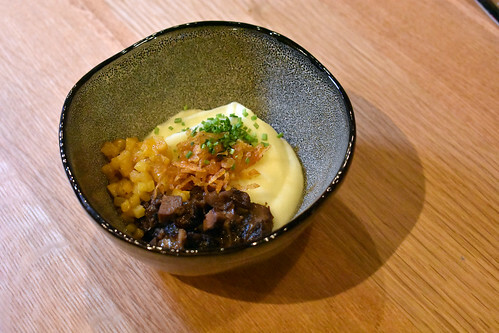 It’s a reasonably priced date night and a perfectly approachable way to mosey into fine dining. We’re looking forward to brunch service!